Pancakes are such a comforting breakfast food. 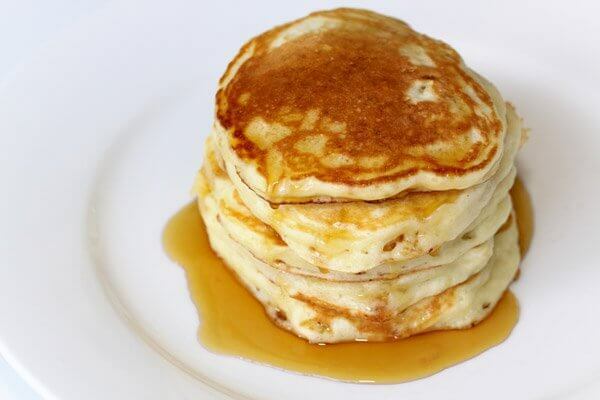 Nothing beats a warm stack of pancakes soaking in maple syrup on a cold winter morning. Or in today’s case, the morning after an April snow storm in Montreal. Pancakes come together very quickly. Mix the dry ingredients, then the wet ingredients and mix only until barely incorporated. It should still be lumpy. If you mix more, the pancakes will be tough. Once you’ve tried the straight-up version of this buttermilk pancake recipe, you can experiment with countless variations. We typically substitute half the buttermilk with yogurt. This makes a thicker batter and fluffier pancakes. Other fun variations include adding small berries, crumbled crisp bacon, or adding some whole wheat flour for increased fibre content. Tasted these and are delicious.